Like most countries, Cambodia has traditionally relied on rote learning to impart knowledge to future generations. Students sit compliantly in neat rows, copying from chalkboard to notebook, as directed by a teacher. While this has its place, Arang Raingsey School is introducing a new, pro-active approach to learning in line with the demands of Cambodia’s diversifying economy and the need for skilled labour. “Critical thinking”, “creativity”, “communication”, “commitment”, “collaboration”, and “confidence” – the schools “6Cs for learning” are reflected on white signs above the classroom entrance. Beneath these signs, young teenagers enter the room in crisp white shirts, ready to learn. “With personal hygiene, students proactively learn about healthy eating, living in a clean environment and puberty. Even if you are a boy, you need to understand about female biology and feminine hygiene issues!” says Try Chanrra. In partnership with the Ministry of Education, Youth and Sport, and with funding from SIDA (Swedish International Development Cooperation Agency) and SDC (Swiss Agency for Development and Cooperation), UNICEF has helped provide life skills education workshops for school directors and teachers. ‘Life skills’ are the skills needed to deal with the challenges of everyday life, whether at school, at work or at home. They include self-reflection, analytical thinking, problem-solving and interpersonal skills. They underpin the “6Cs” used at Arang Raingsey School. Such skills can be crucial – as they help students develop both professional competencies for the world of work and social-emotional competencies to enrich their adult lives. Despite the obvious significance of these skills, they are often neglected in traditional, rote-learning environments. Without them, students are less likely to become proactive, engaged, and resilient adults living to their full potential. 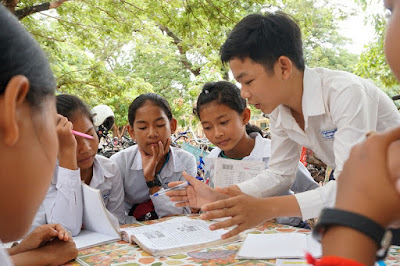 In recognition of this, the Ministry of Education, Youth and Sport recently made ‘local life skills education’ a core subject in the Cambodian national curriculum. With support from UNICEF, local life skills education is taught in both primary and lower secondary schools. The programme engages not only teachers and students in learning, but local communities too. School directors, parents and school committee members get together with teachers to determine what is most relevant for their children to learn as part of life skills education. Topics range from social issues like healthy living to social enterprise, such as learning about how to raise livestock, involvement in food production and establishing small businesses. As part of local life skills, students leave their classrooms. They interview community experts, run their own community campaigns and reflect critically on what they’ve learnt, often as part of community events. For 14-year-old Tab Tola, a student of Arang Raingsey School, life skills education has important benefits. “Life skills helps me feel brave, improves my communication and helps me understand different aspects of life,” he says confidently. Inside his classroom, Tab Tola shows photos of a life skills community campaign he organized together with his classmates. For Tola’s classmate, 14-year-old Youra, life skills education is exposing students to profitable future pathways beyond schooling. “In life skills, I learnt about food production and how to develop a small business. These are key skills to generate an income in the future,” she says. From within the study group, a chorus of laugher erupts, as the teenagers bounce from one topic to another. One of the students is 14-year-old Paaet. “Respect for others and self-discipline,” he responds quickly, when asked his opinion on the most important skills adolescents should learn today. Like many in the Arang Rainsgey school community, Paaet’s five older siblings are farmers of poorer means. To get by, they also help their father, a self-made ‘handy man’, with local house repairs. For Paaet, however, future career options are many. “I’d consider being a vet, a policeman, maybe a teacher,” he says. At Paaet’s home, some distance from the school, his parents reflect on their hopes for Paaet and his friends at Arang Rainsey school. As part of the school community, they attend school meetings and are always pleased with the feedback about their son’s learning. “We’d just like to see him be a good person. We hope he can study hard, get a job and be a caring and respectful person. We believe those who are well educated know how to treat others with respect and kindness,” they agree. Back at the school, Tola and Youra reflect on their own futures. “I want to be a doctor when I grow up. I remember when my grandmother was sick and I was the only one able to help her read English to identify her medicines. I want to be able to help others, like my grandmother,” says Tola. “Whatever profession people choose to follow, you need a teacher to help you get there. By becoming a teacher, I can help others become what they want to be,” adds Youra. Around her, buzzing adolescent banter grows, as students spill out of classrooms and into the courtyard, ready for what’s next. A speckled kitten passes by. With dimpled grin, Youra scoops her up and nurses her gently, a warm excitement in her eyes. 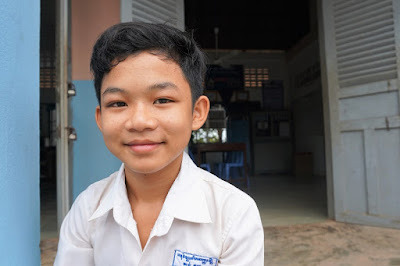 The path ahead looks positive for these adolescents, the faces of Cambodia’s future.